National Security Adviser, Col. Sambo Dasuki (retd. ), or be prosecuted for money laundering. 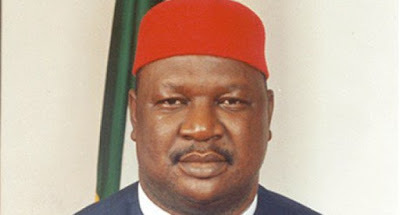 It was learnt that Anyim, who is also a former Senate President, was still in the EFCC custody on Saturday and might remain there until investigations reach a logical conclusion. The source explained that the commission was not in a hurry to release Anyim on self-recognizance as he was known to shun invitations. Meanwhile, it was learnt that the EFCC had invited companies that received contracts during Anyim’s tenure. Anyim was also accused of awarding contracts to some companies linked to him through which ecological funds were allegedly diverted. The companies include Foundation Years Limited, Precious Integrated, Precious Petroleum, Mak & Mak, Chap Construction, Eldyke Engineering, Pryke Limited, Chipa Nigeria Limited, Prima A11 Limited, Pima International, Chanto Engineering, Ishiagu Microfinance Bank, Mulak Ventures, Vitro Engineering and Tip Top Nigeria. “From this fund, three of the companies linked to Anyim – Foundation Years, Obis Associate and Eldyke Engineering – received contracts worth over N13bn. Foundation Years alone received a net payment of N10,308,017,838.85 between 2014 and 2015.